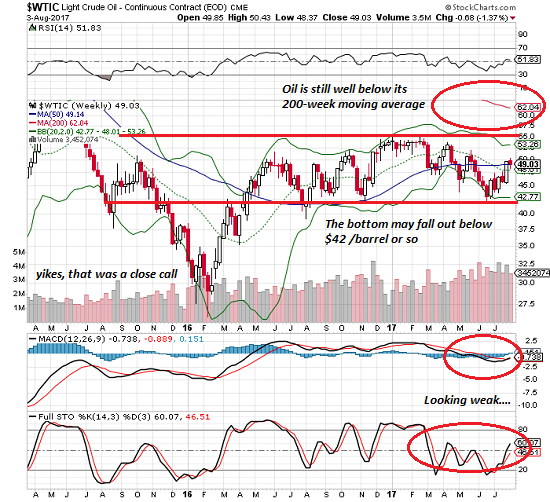 oftwominds-Charles Hugh Smith: Is Another Oil Head-Fake Brewing? The dramatic declines in the costs of oil production will be boosting supply at the very moment that demand is falling. Over the past decade I've addressed what I call Head-Fakes in the cost of oil/fossil fuel: even though we know the cost of extracting and processing oil will rise over time as the easy-to-get oil is depleted, oil occasionally plummets to such low prices that we're fooled into thinking it will remain cheap for a long time to come. This drop in price is a head-fake, because over time the depletion of the cheap-to-extract oil will push global prices higher. Why does this matter? Economists have noted for decades that spikes in energy costs tend to trigger recessions for the obvious reason: the more households and businesses spend on energy, the less they have to spend on goods and services. When the price of oil drops, people buy larger, fuel-hungry vehicles because the operating costs are reasonable at the moment of purchase. The need to conserve declines across the board, setting up a high consumption level that establishes a high cost basis when oil returns to its "natural" price levels. Correspondent Joel M. submitted an article that explains one reason why oil may plummet in price: oil companies are dramatically dropping the costs of production in order to remain profitable as oil has fallen from $100/barrel to $50/barrel. Ironically, this drive to lower costs to make oil profitable at $50/barrel or lower is sparking a production and investment boom that promises to boost production in the near-term. Race to Bottom on Costs May Cause Oil to Choke on Own Supplies (via Joel M.). Wael Sawan, the head of Shell’s deep-water business, said the company had been able to reduce the cost of its wells by 50 percent over two years. The biggest reason: Shell now uses just four standard well designs worldwide, compared with dozens previously, according to Sawan. "We are going to see more material cost saving in the next couple of years," he said in an interview. With costs down from shale to mega-projects, companies big and small are starting to green-light more investment. Shell for example just approved the Kaikas deepwater oil field in the U.S. Gulf of Mexico, the first to get a go-head from the company in more than two years. The project will make money at less than $40 a barrel after Shell reduced its projected costs by 50 percent. Though the global stock market is in a euphoric uptrend at the moment, many observers see the inevitability of a global recession as China dials back its astonishing credit expansion/housing bubble. Having created $30 trillion in new credit, China's financial authorities are trying to cool down that runaway credit expansion without choking the Chinese economy. Their modest tightening in 2014 deflated their housing bubble, and the trickle-down effects soon slowed the global economy to a crawl. As many of us have noted, no structural problems have been solved over the past eight years globally; all we've done is create unprecedented sums of new money in the form of credit and sovereign borrowing to keep the bubbles inflated. At some point, diminishing returns on new debt will trigger a break in the ability of households, corporations and nations to service their rising debt loads, and a retrenchment/recession of some size will occur--even if central banks flood the financial sector with liquidity and lower interest rates. They can't force households and corporations to borrow more, though they will try. Any significant reduction in global demand for oil will trigger a sharp, sustained decline in the price of oil. Price for commoditized goods and services is set on the margin; a 5% decline in demand doesn't necessarily reduce price by 5%; if the drop in demand shifts the the global supply into chronic over-supply, it may trigger a price drop of 25% or more. The dramatic declines in the costs of oil production will be boosting supply at the very moment that demand is falling. This imbalance will crush the price of oil, perhaps as low as $25/barrel. Some analysts are predicting sub-$20 oil. Low prices will devastate profits and oil-exporting nation's oil revenues, and perversely remove incentives to conserve energy. These two dynamics will then set up the next oil spike, as production will decline while demand will be boosted as economies use more "cheap oil." The global economy will quickly adjust to low oil prices, and decisions will be made to raise consumption based on those low prices. When oil inevitably spikes higher as supply is slashed and demand increases off the recessionary trough, everyone will be "surprised" that low prices didn't last. That's the oil head-fake in a nutshell. Note to readers: Life has put a full-court press on me the past week, and the pressure will remain intense for the rest of August. I am unable to respond to any email or messages, and the blog will be put in maintenance mode. Thank you for your understanding. Thank you, John S. ($50), for your wondrously generous contribution to this site -- I am greatly honored by your support and readership. Thank you, Kathy B. ($25), for splendidly generous contribution to this site -- I am greatly honored by your support and readership.